Nanoparticles disguised as human platelets could greatly enhance the healing power of drug treatments for cardiovascular disease and systemic bacterial infections. These platelet-mimicking nanoparticles, developed by engineers at the University of California, San Diego, are capable of delivering drugs to targeted sites in the body-particularly injured blood vessels, as well as organs infected by harmful bacteria. “This work addresses a major challenge in the field of nanomedicine: targeted drug delivery with nanoparticles,” said Liangfang Zhang, a nanoengineering professor at UC San Diego and the senior author of the study. 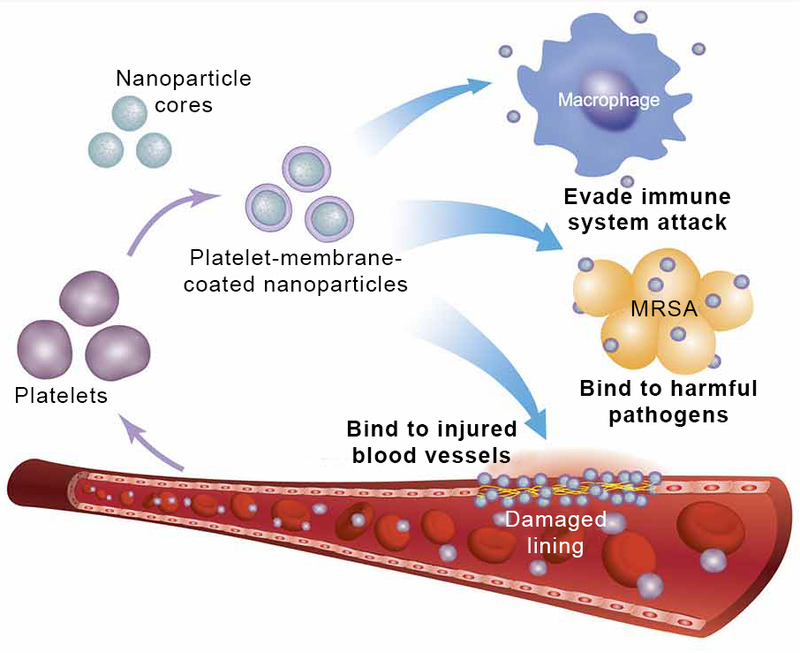 On the outside, platelet-mimicking nanoparticles are cloaked with human platelet membranes, which enable the nanoparticles to circulate throughout the bloodstream without being attacked by the immune system. The platelet membrane coating has another beneficial feature: it preferentially binds to damaged blood vessels and certain pathogens such as MRSA bacteria, allowing the nanoparticles to deliver and release their drug payloads specifically to these sites in the body. The nanoparticles can be packed with many small drug molecules that diffuse out of the polymer core and through the platelet membrane onto their targets. In one part of this study, researchers packed platelet-mimicking nanoparticles with docetaxel, a drug used to prevent scar tissue formation in the lining of damaged blood vessels, and administered them to rats afflicted with injured arteries.